Town of Berkeley Springs, Morgan County looking south; CNB Bank (left) and The Country Inn (right). Photo taken on June 3, 2018. Sleepy Creek at Highland Ridge Road in Berkeley Springs, Morgan County. Photo taken on June 3, 2018. Bevans Industrial Lane in Paw Paw, Morgan County has collapsed. Photo taken June 3, 2018. 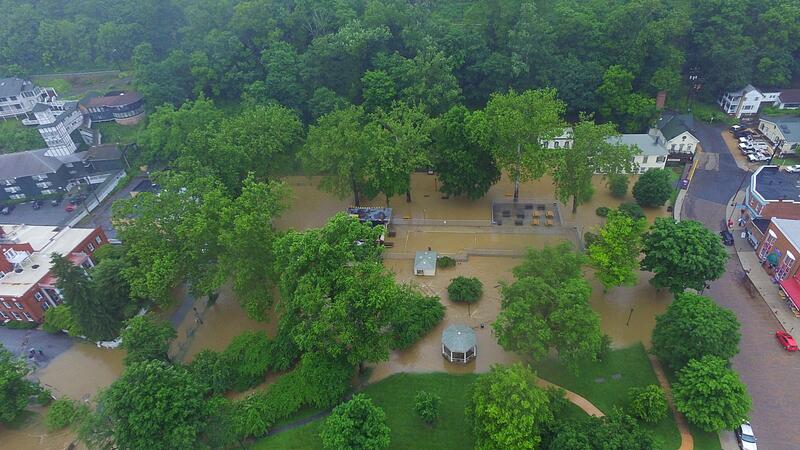 Severe storms hit parts of the region on Saturday and brought with it flash flooding and high waters in some areas. Morgan and Hampshire Counties were hit the hardest, seeing 6 to 8 inches of rain, according to the National Weather Service. 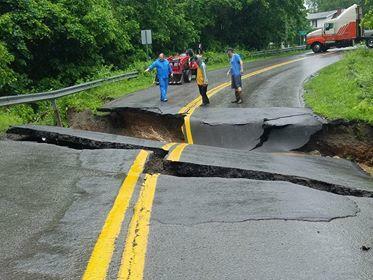 More than 30 roads were closed in Morgan County and several sections of road have been damaged or washed out. Stefanie Allemong is the Acting Director of the Morgan County Emergency Management Agency. She says there were 14 swiftwater rescues on Sunday – either out of vehicles or from homes, but no injuries were reported. 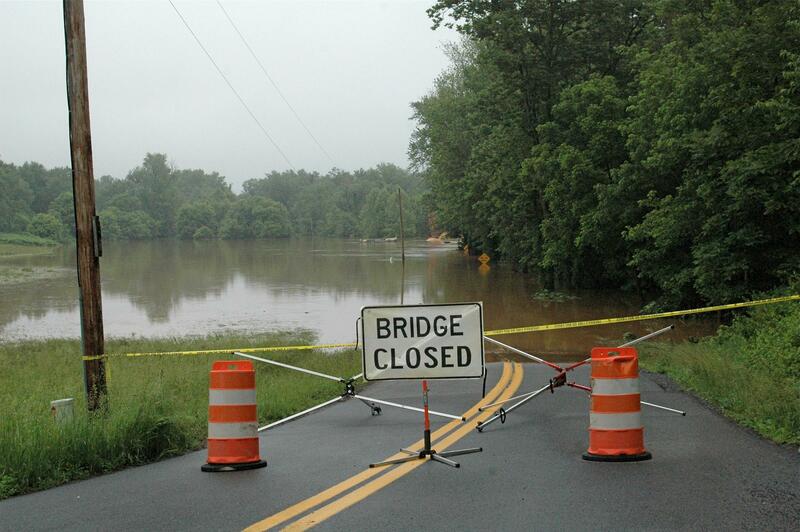 Bridge and construction equipment underwater on River Road in northeastern Morgan County. Sleepy Creek is backed up where it runs into the Potomac River. Photo taken on June 4, 2018. She says most of the water began to recede on Monday, and most roads in the county have reopened. “So basically, we’re looking at mostly road damage and debris cleanup and some bridges and culvert damage,” she said. The extent of damages or estimated cleanup costs is still being determined by emergency officials. A flood warning remains in effect for parts of Morgan County through Tuesday afternoon. West Virginia Gov. 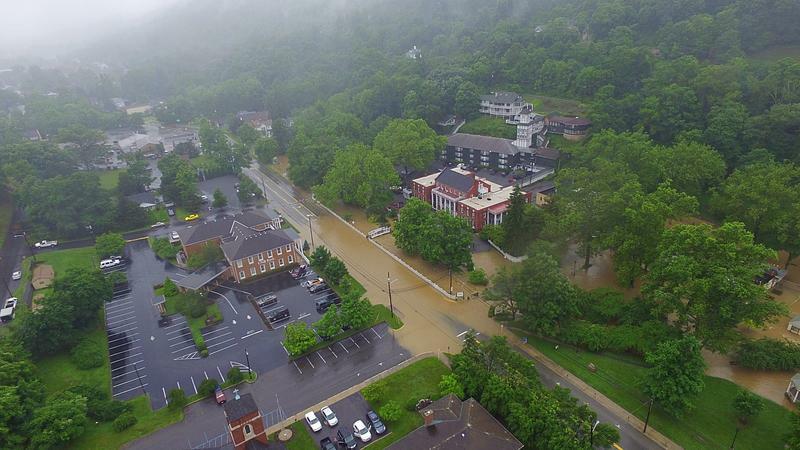 Jim Justice has declared a state of emergency in eight counties for flooding from heavy rains. The governor's office says in a news release that some emergency evacuations were underway Sunday following severe storms. 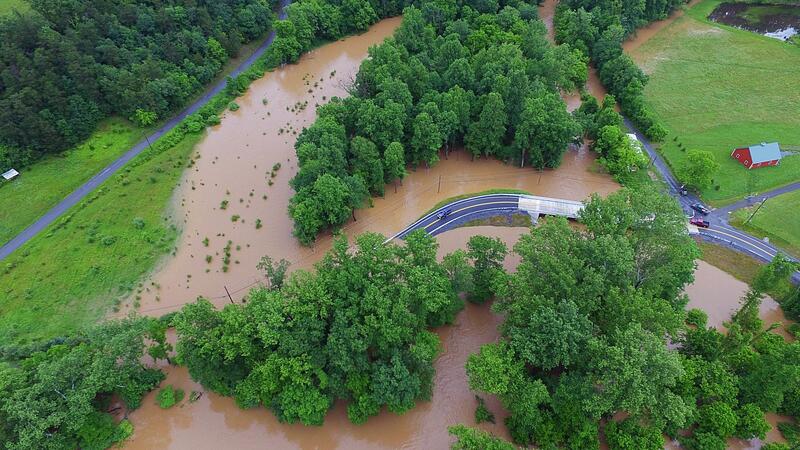 The National Weather Service says moderate flooding is forecast along the South Branch of the Potomac River, which is expected to crest nearly 5 feet above flood stage by Sunday night. It says minor flooding is occurring near the Cacapon River, which is expected to crest about 5 feet above flood stage. Minor flooding also is forecast along the Potomac River at Paw Paw.